I am jumping from one extreme to the other on this blog recently, from slow cooking to super-fast cooking. I love cooking and baking, but my love for it is somewhat diminished on a Tuesday evening after a long day at work. This is when I like things super-fast, I always have stir-fry vegetables in my fridge for those nights when the temptation will be so strong that you might just phone a takeaway instead. The funny thing is that preparing a stir-fry often means dinner will be on the table much faster than waiting for the delivery guy! A lot of the time to keep stir-fries really quick and simple I make them vegetarian (as it keeps the cook time down), although I have made a huge number of chicken and beef stir-fries for those nights when the other half wants “animal” – his choice of words not mine. A salmon version is a great variety and helps us to eat more fish, which I always find really hard to do. Anyone know any great tasty fish recipes – I’d love to give them a try! ~ serves 2. Invented in my kitchen tonight, based on every stir-fry I have ever made! Mixed stir-fry vegetables, I used baby corn, halved lengthwise, mangetout, green beans, mushrooms and red cabbage, but there are lots of different vegetables to chose from bell peppers would also be a great addition, and I have heard kale is amazing in stir-fries. 3 teaspoons of Chinese 5-spice powder. 1 tablespoon of tomato ketchup, I used a reduced sugar and salt version. 1 tablespoon of White Wine Vinegar, but Rice Wine Vinegar would probably be better. Add the onion and salmon fillets to a frying pan or wok under a high heat. I often don’t add oil when cooking a stir-fry, which I guess is a little strange. However with a good non-stick pan you should only have to add a very small amount, if any at all. Leave till the Salmon is starting to brown around 5 minutes, on the top (uncooked side) sprinkle 1 tsp of 5-spice powder on each salmon fillet. Make sure to coat the top side of the fillet evenly, then once the bottom is browned flip each fillet over. You can now add the vegetables and the remaining 5-spice into the pan. Occasionally while the vegetables are cooking move them around the pan, so they don’t burn, but be careful to not break up the salmon fillets. After around 3 minutes add the tomato ketchup, the soy sauce and vinegar. Turn down the heat and continue to cook for another 5-8 minutes until the salmon is cooked through and the vegetables are cooked. If the sauce begins to dry out add some water (I added about 1/4 of a cup to mine). While the salmon and vegetables finish cooking cook your noodles as per their packet instructions. Remove the salmon fillets from the pan and place on a plate. For the last 2 minutes of cooking add the noodles to the pan, and stir so they and completely coated in the sauce. 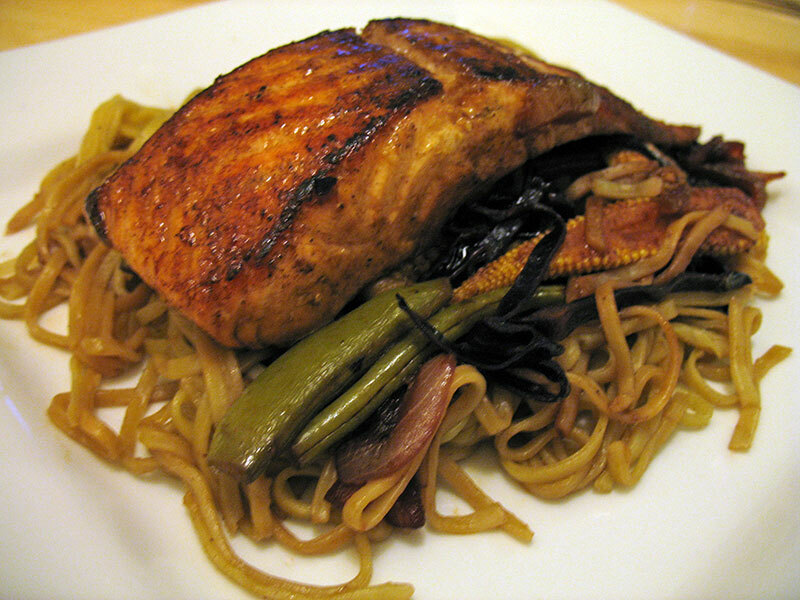 Add the noodles and veg to each plate and top with a salmon fillet. Voila!